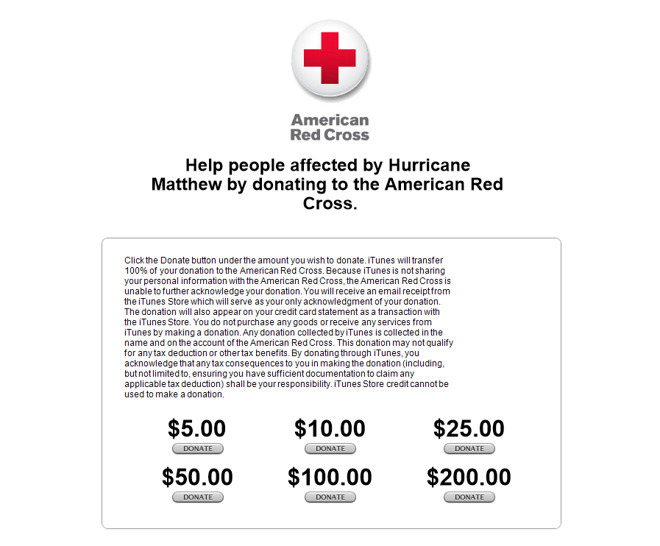 Apple on Monday began taking iTunes donations towards the relief of Hurricane Matthew, which recently tore through a number of Caribbean countries, as well as several U.S. states including Florida and the Carolinas —killing hundreds, and leaving many more homeless or otherwise in need of aid. The company is accepting donations in $5, $10, $25, $50, $100, and $200 increments, giving the whole of the money to its usual charity partner for disasters, the American Red Cross. Apple warns that people can't use existing iTunes credit to make a donation, and that people looking to write the money off on taxes are responsible for documentation. Links to the donation page are currently visible from Apple.com, the iTunes Store, and the App Store. Apple regularly sets up iTunes donations for well-publicized disasters. Some other recent examples include flooding in Louisiana, and the Fort McMurray forest fires in Alberta, Canada. In the latter case, Apple partnered with the Canadian Red Cross.